The shade of emerald green is such a beautiful one don't you think? No wonder it's Pantone's color of the year. You first saw me wear these pants here and I still love them as much as when I first got them. They can easily be dressed up or down and I have had so much fun playing around with different options. I still wanted these to be the standout in my outfit, so I wore neutral tones against the pants (black and grey). I'm ready to try out other colors next time. Purple...mustard yellow...maybe even pink. What do you think? Love it on you! The jewelry comb is great. They would be so fab with pink! Great oufit! Love this! And, I love that the color of the year is Kelly Green. 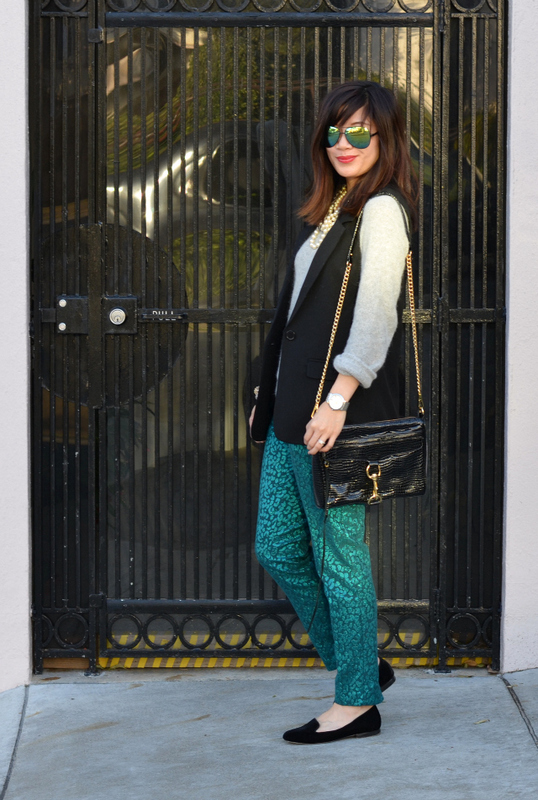 I swooped the green trousers from Asos on Cyber Monday. Waiting to get them back from the tailor. Can't wait to wear them! Love your awesome pants! And the vest is so cute, you look great! I love those trousers they are fabulous! Perfect for the holidays! I love your shoes and accesories too. 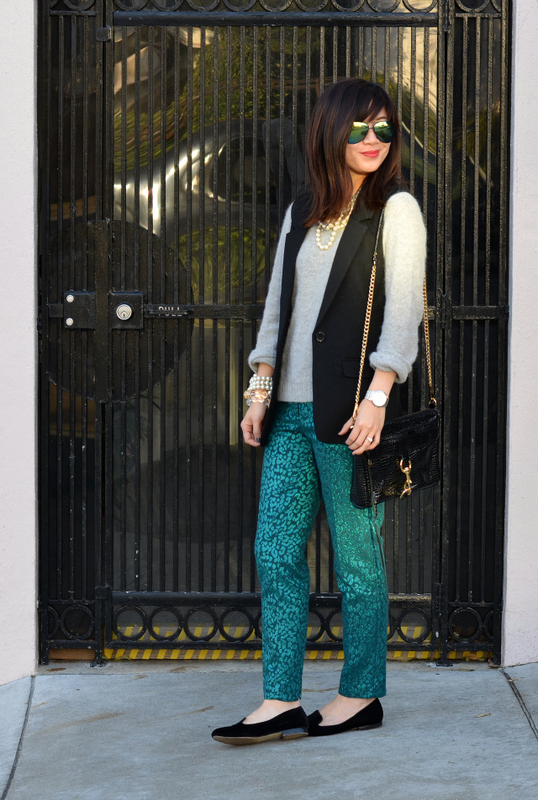 Mirrored sunnies, your pearls and pants... just amazing! :) such a cute look! Ooh cool pants ! :) Love your bag too. hey nancy! you should definitely try out more colors. very suiting for you! those pants are fab. love the texture and color. LOVE your pearls girl! You've kept the focus on the pants by doing all neutrals. I can really see these pants with a vibrant red or purple too. This is such a cute outfit! I'm loving the accessories...the pearls are so pretty! You accessorize better than anyone I know. I love the shiny details on your pants! Love your necklaces and the vest is such a fun piece! I really do love this color, but I don't really have anything emerald in my closet! Time to go shopping! Again, my fav pair of pants! Just adore that shade of green...and with the loafers they have a fun sort of Turkish feel. This green trousers are just great! 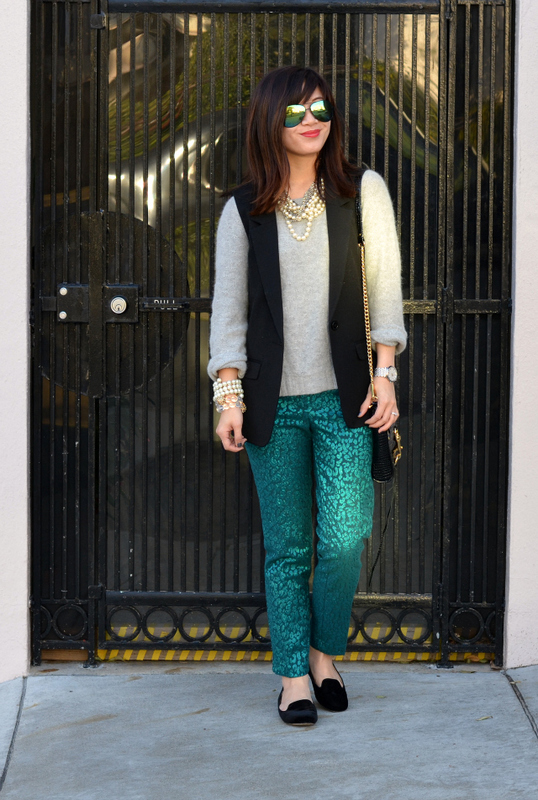 You are totally on trend with those lovely emerald pants....& love how you mixed & matched it! What a gorgeous shade of green! 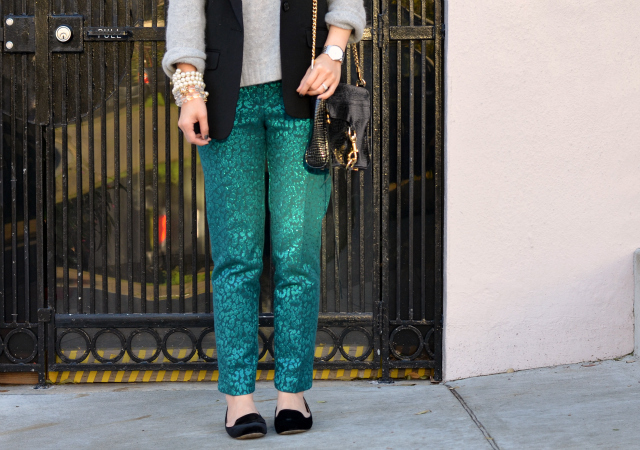 Love how you paired those pants with a cozy grey sweater... so chic! I love the bag, pretty look! LOVE those pants! They are so festive and they look great on you! I'm so excited emerald is the color of the year, it's going to be a good excuse to get more items of that color, especially since its my birthstone! I don't know if I'd be brave enough to rock these pants, but they look great on you!